Body medium sized with a strong brown pigmentation (see figures). Stage 4 tentacle: body length about 200 µm; preoral lobe diameter is approximately equal to the length of the larva. Stage 8-T: about 250 µm; the larvae escape from the nidamental glands. Stage 20-T: about 700-800 µm (see figures), without blood masses or adult tentacles nor metasomal sac. Close to metamorphosis larvae may reach the stage 40-T. Description and figures according to Temereva et al. 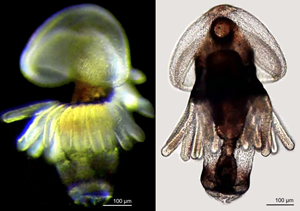 (2016) - note that in their work, the larva is never identified as Actinotrocha australis which I cite here here under this name, according to Nielsen (2013) and ICZN (2015: opinion 2373, Case 3626). Temereva E.N., NeretinaT.V. & A.N. Stupnikova, 2016. Original description of larval stages of Phoronis australis Haswell, 1883 and analysis of World fauna of phoronid larvae [in Russian]. BioIogiya Morya, 42 (2), 104-114.